Heat oven to 400°F. In 2-quart heavy saucepan, melt 1 cup butter over medium heat. Continue to cook, stirring constantly, until butter is light brown. Cool at least 10 minutes. In large bowl, mix browned butter, 2 cups brown sugar, 1/2 cup milk and the eggs with spoon. Stir in flour, baking soda and salt. Drop dough by rounded tablespoonfuls about 2 inches apart onto ungreased cookie sheet. Bake cookies 9 to 11 minutes or until almost no indentation remains when touched in center. Cool 1 to 2 minutes; remove from cookie sheet to wire rack. Cool completely, about 30 minutes. Meanwhile, in 2-quart saucepan, melt 1/2 cup butter over medium heat. Stir in 1 cup brown sugar. Heat to boiling, stirring constantly. Stir in 1/4 cup milk. Heat to boiling; remove from heat. Cool to lukewarm, about 30 minutes. Gradually stir in powdered sugar. Spread Caramel Frosting on cookies. 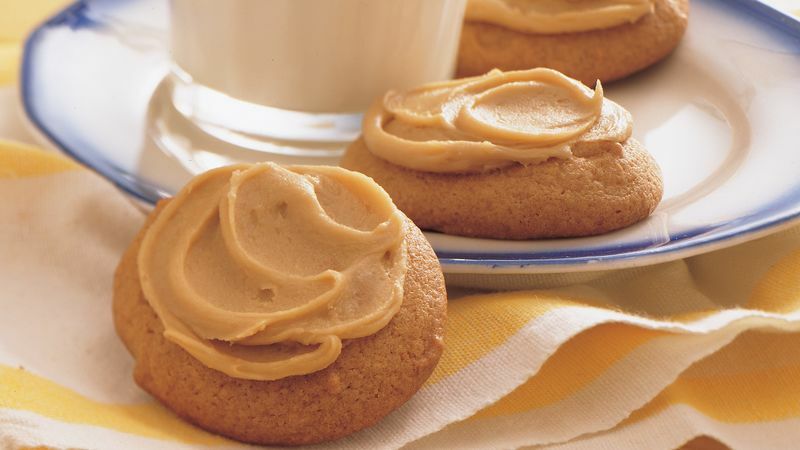 One tub Betty Crocker® Rich & Creamy dulce de leche (caramel) frosing can be substituted for the Caramel Frosting.